Bentley we loved you so much. We only had you for 5 short months. 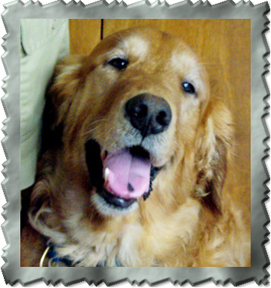 You came from Golden Rescue & we knew nothing of epilepsy at the time. But we learned a lot fast. We miss you a lot but we are happy you no longer have to battle the monster. Mishka you were a much loved bouncy spring of a husky who came to us as a cuddly puppy with huge paws in the summer of 1997. You never really grew up and right until youbecame ill you never failed to boisterously greet each and every person you came into contactwith. Everyone loved you. We were always wondering when you would slow down, but you never did. We likened you to TIGGER from the Winnie the Pooh stories as you were always bouncing from one thing to the next. You bounced through the house, leaving a never ending trail of husky hairs - a lasting legacy as we'll be cleaning them up for years to come! When Oddy arrived in the house you thought we had got him for you. You both bonded immediately, a tiny black and white border collie and a huge fluffy two year old bouncing husky. 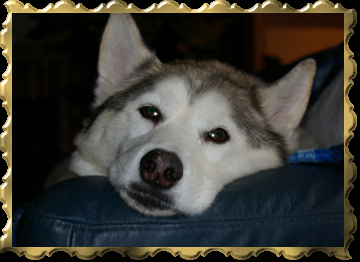 Oddy, once he grew up, stood up to my other huskies and made sure you were safe from harm, you were his endless friend. You never minded when he rushed up andgrabbed your paws in play, you just sideswiped him and knocked him off his feet. We are sure you are now bouncing up there at the rainbow bridge with Tass & Squeeky. Hope there are sofas there! I lost my best friend of sixteen years on October 14, 2009 at 3:45 pm. I remember 16 years ago on July 4, I had canceled a trip I was going to take and was sitting on the porch when I heard a small cry. The grass was about two foot tall at the time due to the mower being broken so I could see nothing but the slight bending of tall weeds. I heard the small cry again and went to the door, outside by the step, I could see the grass move. As I stepped out I saw a tiny black and brown puppy about 6 weeks old. Living in the country on a dirt road it was obvious that someone had dropped him off, someone who couldn't be bothered with him. I am so thankful that he FOUND me. He has been a precious gift and brought such joy and love into my life. I named him Boston. Boston loved to travel and we had many trips together, we traveled from Florida to Maine, New Brunswick and Nova Scotia. One year we went to New Hampshire and hiked Mount Washington together, his little beagle legs jumping from rock to rock his nose catching the scent of rabbit on the trails would be sure to give the melodious beagle bay to my ears, how I loved to hear him bay. A couple of years later, we went to the Appalachian mountains to enjoy cooler weather where he would race down the hillsides looking for bunnies to chase. He was a constant companion, as I would work around the farm he would come and sit next to me and watch what was going on sometimes grabbing a tool and taking off with it for a game of catch me if you can. One day as I was setting fence posts he sat watching from a distance. The day was drawing to a close and I was trying to get the last few posts set when I saw him rise and slowly walk over to me. I paused my work as I watched him carefully make his way between my tools scattered on the ground. Finally reaching my side he looked up at me with his now aged eyes and promptly sat down on my foot. As he stay there on my foot looking out at the sunset he was letting me know in his own wise way that work was over, it was time for us to enjoy the beauty and peace at the end of the day. His little face turned from brown to gray as the years past and he was not able to run like the wind anymore (in his mind he was uncatchable) He became almost totally deaf and couldn't see very well but he still wanted nothing more than to go out in the field with me and try to scare up a bunny or two. He suffered from epilepsy from the age of eight but it wasn't epilepsy that took him from me, he was seizure free for almost six years. I lost my little boy to an undiagnosed disorder. He struggled for three months and then his little body could do no more. The day before he passed, I carried him in my arms down our dirt road to all the places he used to love to go. I put him down and let him visit all the spots he loved to sniff and explore as only a beagle can. On our last day together, I carried him in my arms, breathing in the scent of him, his soft warm head braced against my heart, we talked with each other remembering our youth and adventures long gone. We ended up in the back field where he use to like to chase bunnies and we sat in the sun lit dewy grass as the butterflies flew overhead in search of their nectar. As I lifted him in my arms again I could feel the lightness of his once muscular body while I futilely tried to hold back the tears that fell on his now gray face. I carried him to the car and placed him on the seat beside me and we went to see his best friend Sidney to visit for a while and then we started for home, not knowing it would be our last journey together. He passed a couple hours after our trip, at home, as I held him in my arms and kissed his sweet small head. May you always be chasing bunnies. My Boy, A short time in my arms, FOREVER in my heart. 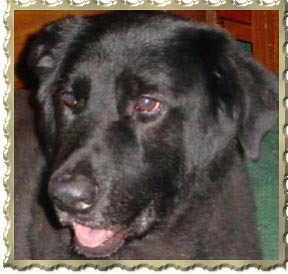 I have had many wonderful pets in my life, but Gage, the Wonder Dog, you were extraordinary. You were an inspiration to all who knew you and a source of strength to me. In spite of terrible cluster seizures, never did you display anger or frustration, only determination. When the vet gave up,we didn't. We found another vet and continued to seek control. You always trusted me and swallowed 15+ pills a day without a struggle. You could break into the refrigerator, oven, and crockpot. You removed the food you wanted-including an entire cooked turkey- without making a mess. You kept me warm at night and let me hold you when I was sad. You ate the filling of Easter baskets, socks, underwear, gloves, and kitchen towels. Two times, you had to have major surgery to remove these items and bounced back to the complete and utter amazement of your doctors. Sadly, the third surgery was too much and the damage too great. You fought and struggled for three weeks, but you just couldn't recover. Letting you go was brutal, painful, and heartbreaking. You were my heart and soul. I had trouble taking two breaths in a row without gasping for air. I still look for you around every corner and the great memories still weigh heavy on my chest and cause a lump in my throat. As time goes on, I do not miss you less, but I have learned to handle it better. I find myself thinking of your funny cocked ear and I smile. When friends tell a funny story about you, I even can bring myself to laugh as a tear trickles down my cheek. 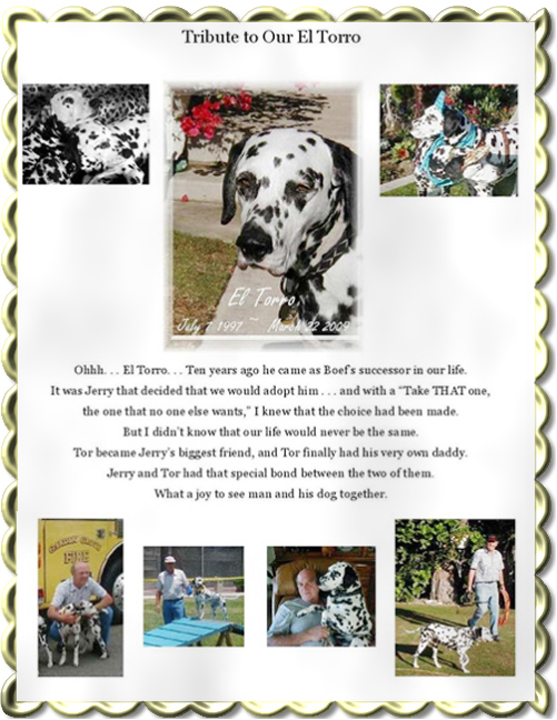 The pain is a tribute to the love I shared with a special dog. For all the pain your loss has caused, if I could go back to the day nearly 11 years ago when you bounced into my life and changed it for the better forever, I would do every minute over again. My friends and family believe that for all these years, I had been saving you. In reality, it was you who saved me. You were my once-in-a-lifetime dog and you will always be in my heart. Rest in peace, my brave angel. Find your beloved KeeLee beyond the Rainbow Bridge and run and play, seizure-free. 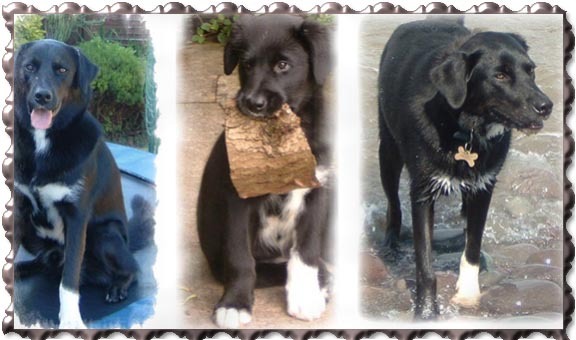 We brought our Lab X Ollie home on the 16th April 2008, 7 1/2 weeks old and he was such a happy and gorgeous puppy, our 1st dog. He never whimpered at night, he settled down quickly and was an absolute joy.. He had his first 2 seizures in March this year, and a bad cluster in April and June with up to a week of bad postictal, at which point he was referred to a specialist and had a brain scan, ultra sound scans, spinal taps etc, to establish nothing was wrong - we were so relieved. (Thanks here to our fab insurance company who paid for everything and a lot more after). Then we had a fabulous 13 weeks seizure free. At the beginning of September and October he had another 4 single ones and his postictal was almost non-existent, although he had more fits closer together, this still felt like progress. Then on 28th October he had a seizure at 3.15am, and another at 11.30am and so on, every couple of hours until he was admitted to emergency. During this time he just paced and walked around all day and sometimes barked (although he would still respond to food AND do a "hi 5 for it") He was not able to sleep, each time he tried he had another seizure. On the last one at home he could only walk in a clockwise direction and appeared blind and possibly a bit deaf I wonder if he had brain damage. He had to be anaesthetised for 7 hours to stop them and the next morning when he came round we were all hopeful and everything was looking good. The nurse had taken him for a little walk, he ate his breakfast and at 1pm we were asked to collect him at 2pm. However when we got there, he had sort of collapsed on his side, unresponsive, and then seized badly again. The vet advised putting him to sleep. After we agreed my daughter and I spent a bit of time with him before hand; at one point he raised his head to try to find us as he must have heard our sad words and goodbyes, but he was still so far out of it. My daughter left the room as she couldn't face it, but didn't want him to be alone she waited outside the door and wrote in very small letters "I love Ollie" in the condensation on the window. I stayed with him and watched him slip peacefully away. I've regretted it a lot since, wishing I had done more for him, I felt we all gave up on him too soon. But as the time passes I hope common sense prevails and I accept what I probably already know, that it was the best thing for Ollie. He had an awful last day and how many more of these would he have suffered if we had kept him alive? When he was about 12 weeks we took him to Kennel Club Training where he achieved the Puppy and Bronze medals very quickly. He was soooo easy to train because he would do anything at all for food! He loved other dogs too, was really sociable and I used to wait with trepidation whenever we met one on a walk would he recall or not sometimes he would and like all other puppies, sometimes he wouldn't. However, I had no such trouble in the last 8 months: however much fun he was having, one little call or whistle and he turned on his heal and raced back to me. I was always so proud of him. Nearly every time I walked him someone would comment on how handsome he was, or how well behaved, how they loved his white sock etc. He also adored people he would not have made a good guard dog, because he never barked when people came to the door, he just stood there in anticipation of some attention. He used to push his head through the cat flap to look around and as he got older and only part of his head would fit, but it was still enough to "chat" to the window cleaner when he came around! He made us laugh because whenever anyone jumped onto the trampoline, he would hear the springs from wherever he was in the house, and he would charge from the house to jump onto it too, he surprised several unsuspecting children doing this (disconcerting having an 80lb dog charging at you!). He used to sunbath on it in the day too, and sleep on it in the evenings when he was too warm in the house. When I was home he often used to follow me everywhere this happened much more since the epilepsy started. He would follow me to the toilet and lie at my feet. I would be in the shower and he would poke his head around the curtain, and then spread out on the floor just where I needed to step out! He used to steal logs out of the basket often removing 3 or 4 until he found the "perfect" one. We often had to vacuum up the bark he stripped off these logs - it was quite a pastime for him. He liked to eat it too if we didn't stop him! He learned to swim properly in August and seemed to really like the water. He would always paddle in the river or sea (or a paddling pool! ). He didn't really like getting dirty though and would hop around a muddy puddle, rather than go through it. When we walked in the woods, which we did the night before his last cluster started, he retrieved sticks and ran into the woods. My daughter or I would hide and when he realised one of us was missing, he would stop, stand alert and then he would listen and find us, looking very pleased with himself. On this last walk, it was strange because we both commented on how normal and like his old self he was before the drugs etc. If he heard us get the cheese grater or bread knife out, he was there, always hopeful. I used to pretend to accidentally drop bits of cheese onto the floor, and then tell him he could have it. My daughter used to share Frubes with him, (these are tubes of fromage frais/yoghurt), and somehow he knew how to drag the plastic through his front teeth to squeeze out the contents. He would lick this for ages after, if we allowed him to. He was so funny, and so food orientated (even worse of course after seizures and starting the meds). He was a family dog, but he was more mine and my daughter's and we miss him so much. I hope there is a place called Rainbow Bridge, because this poem has been a comfort to us both. I never imagined how painful this loss would be; is it easing 3 weeks later? barely. 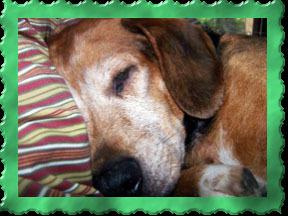 We love you so much Ollie and hope that you are having a great time at the Rainbow Bridge ( but not eating too much!). We miss you so much and we will NEVER forget you. We felt you had such a short life that you deserved a long memorial.